Zambia has had a fairly long history of implementing competition law in comparison with other countries in the Eastern and Southern African region. In June, 1994 the Zambian Government endorsed the need for a national legislation to create and safeguard structures and encourage bahaviour which prevents anti-competitive practices, to ensure markets operate efficiently and protect the welfare and interests of consumers thus the establishment of the Competition and Fair Trading Act and Law. However, the Act has not been fully implemented due to lack of a policy on competition. This unsatisfactory implementation of the Act has also been recognized by most stakeholders; hence the urgent need of formulating a competition policy. The competition law on the other hand has also not fully been practiced in Zambia due to lack of a Competition Policy and this has caused a number of challenges in the effective achievement of the objectives of the Competition and Fair Trading Act under which MCTI operates through ZCC. In any economy, for any Act and Law to be effectively and fully implemented, the existence of a Policy is cardinal. Thus, non existence of an elaborate Competition policy has been a major challenge in the execution of the Act and Competition law. It was from this background that ZCC proposed the formulation of the Policy under the auspices of the Ministry of Commerce, Trade and Industry (MCTI) in order to marshall political and civil society awareness and support. It was at this point that CUTS through the support of Capacity Building Project for Private Sector Development (CBPSD) sought to take leading role in gathering CSO’s views to complement to the formulation of the policy. CUTS recognizes CSOs, such as small scale producers, farmer groups, and community based organizations, faith based, Small and Medium Enterprises (SMEs) and women’s organizations represent the majority of the economy, but also importantly the vast majority of those who are economically marginalized hence being the best suited to explore and articulate the needs of those who will benefit from a sound competition regime. The general objective of the project is to generate inputs of CSOs in a coordinated and harmonized way in the drafting of the competition Policy. Identifying competition-related bottlenecks (impediments) that adversely affect the various segments of the economy and explore possible means of addressing them. To establish a strong and sustainable working relationship between the Zambian CSOs and the Zambia competition authority. 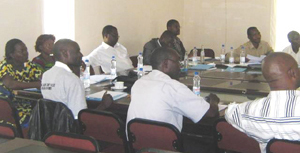 Sensitizing MCTI to better understand the views of Zambian CSOs on the competition law and its implementation.